Please don’t get me wrong, those five words appearing in any random sentence wouldn’t pose any sort of a problem. However, situated as they are in this particular sentence does create a problem because the statement is utterly false. Exadata has not won a single benchmark against any competitor–“key” or otherwise. In Part I of this series I pointed out the fact HP Oracle Exadata Storage Server cells (a.k.a., V1 Exadata) were used in this June 2009 HP BladeSystem 1-TB Scale TPC-H. However, merely involving Exadata hardware can hardly support Oracle’s marketing claim vis a vis winning benchmarks against key competitors. There is a big difference between being involved in a benchmark and being the technology that contributes to the result. I made it clear, in Part I, that Exadata storage was used in that 2009 HP TPC-H result but none of the Exadata features contributed to the result. I clarified that assertion by pointing out that the particular benchmark in question was an In-memory Parallel Query result. Since the result establish Oracle database performance achieved through in-memory database processing I didn’t feel compelled to shore up my assertion. I didn’t think anyone would be confused over the fact that in-memory database processing is not improved by storage technology. Having seen that I began to suspect there may be other readers confused on the matter so I let the comment through moderation and decided to address the confusion it in this post. So now it’s time to address the reader’s comment. If Exadata is used in a benchmark, but Exadata Storage Server offload processing is disabled, would one consider that an Exadata benchmark or was Exadata merely along for the ride? Here is a screenshot of the full disclosure report that shows Exadata storage intelligence (offload processing) features were disabled. For this reason I assert that Exadata has never won a benchmark against “competitors”, neither “key” nor otherwise. I recently took a peek at this online, interactive history of Oracle Corporation. When I got to the year 2008, I was surprised to see no mention of the production release of Exadata–the HP Oracle Database Machine. The first release of Exadata occurred in September 2008. What’s First, Bad News or Good News? The only benchmark Exadata has ever been used in was this 1TB scale TPC-H in 2009 with HP Blades. Be aware, as I pointed out in this blog post, that particular TPC-H was an in-memory Parallel Query benchmark. Exadata features were not used. Exadata was a simple block storage device. The table and index scans were conducted against cached blocks in the Oracle SGAs configured in the 64 nodes of the cluster. Exadata served as nothing more than persistent storage for the benchmark. Don’t get me wrong. I’m not saying there was no physical I/O. The database was loaded as a timed test (per TPC-H spec) which took 142 minutes and the first few moments of query processing required physical I/O so the data could be pulled up into the aggregate SGAs. The benchmark also requires updates. However, these ancillary I/O operations did not lean on Exadata feature nor are they comparable to a TPC-H that centers on physical I/O. So could using Exadata in an in-memory Parallel Query benchmark be classified as winning “benchmarks against key competitors?” Surely not but I’m willing to hear from dissenters on that. Now that the bad news is out of the way I’ll get to what I’m actually blogging about. I’m blogging about the good news. The good news I’d like to point out from screenshot (below) of Oracle’s interactive history is that it spares us the torment of referring to the Sun Oracle Exadata Machine as the First Database Machine for OLTP as touted in this press release from that time frame. A system that offers 60-fold more capacity for random reads than random writes cannot possibly be mistaken as a special-built OLTP machine. 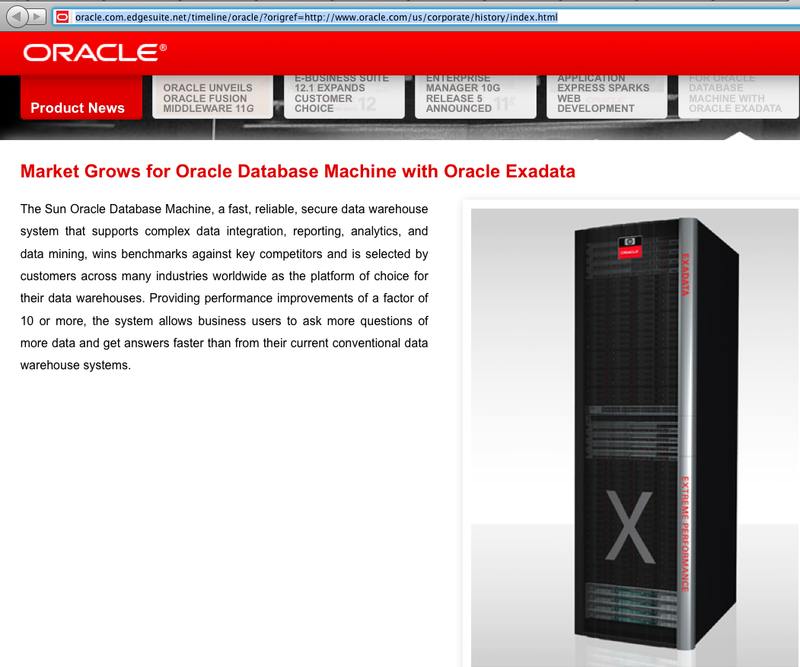 I’m delighted that the screen shot below honestly represents the design center for Exadata which is DW/BI. For that reason, Exadata features have nothing at all to do with OLTP. That’s a good readon the term OLTP is not seen in that screen shot. That is good news. OLTP does not trigger Smart Scans thus no offload processing (filtration,projection, storage index, etc). Moreover, Hybrid Columnar Compression has nothing to do with OLTP, except perhaps, in an information life cycle management hierarchy. So, there’s the good news. Exadata wasn’t an OLTP machine in Oracle’s timeline and it still is not an OLTP machine. No, Oracle was quite right for not putting the “First OLTP Machine” lark into that timeline. After all, 2009 is quite close to 40 years after the true first OLTP Machine which was CICS/IMS. I don’t understand the compulsion to make outlandish claims. Yes, more bad news. Oracle has never published an Exadata benchmark result even with their own benchmarks. That’s right. Oracle has a long history of publishing Oracle Application Standard benchmarks–but no Exadata results. I’ve gone on the record as siding with Oracle for not publishing TPC benchmarks with Exadata for many reasons. However, I cannot think of any acceptable excuse for why Oracle would pitch Exadata to you as best for Oracle Applications when a) there are no OLTP features in Exadata*, b) Oracle Corporation does not use Exadata for their ERP and c) there is no benchmark proof for Exadata OLTP/ERP capabilities. Given all I’ve just said, why is it that (common knowledge) the majority of Exadata units shipping to customers are quarter-rack for non-DW/BI use cases? Has Exadata just become the modern replacement for “[…] nobody ever got fired for buying […]?” Is that how platforms are chosen these days? How did we get to that point of lowered-expectations? * I am aware of the Exadata Smart Flash Log feature. Oracle Exadata Storage Server: A Black Box with No Statistics. A question came in about whether it is possible to measure how much data is filtered out when running a query serviced by a Smart Scan in the Exadata Storage Server grid. The following is the long answer. I’d like to answer this question by taking real information from a test configuration consisting of 4 Real Application Clusters nodes attached to 6 Exadata Storage Server cells with the SAS disk option (12 x 300GB 3.5″ 15K RPM). The Affinity Card Program Test Database (ACPTD) is a test schema and set of queries that mimics the type of queries performed by a marketing group responsible for promoting the use of a retail club card and affinity credit card for a fictitious company. In this example deployment of the ACPTD, the group responsible for promoting club card and affinity credit card activity for Acme Inc has built a data mart with data from several sources, including the main corporate ERP and CRM systems; partner merchant ERP systems; and, outside syndicated data. For this blog post I’ll focus on the main syndicated card transaction table called all_card_trans. However, there are other tables in the schema and for reference sake the following text box shows the table sizes in my current deployment of the test kit. As the query shows, the all_card_trans table is 613 GB. Yes, I know that’s small, but this is a test system and I don’t like watching 6 Exadata cells hammering 1 GB/s each for tens of minutes when a couple of minutes will do. I hope you’ll understand. The following queries show the total row count in the all_card_trans table as well as the number of rows representing transactions with credit cards with leading 4 digits of 3333 and 4447, which represent the card block granted to our fictitious company, Acme Inc, for their affinity card program. This is a needle in a haystack query since only .3% of the data matches the where predicate. Now, before you look at the text box please note that this is a single instance of Real Application Clusters driving this query. And, yes, the RAC node is a small 8-core DL360. Both scans are driving storage at 6 GB/s (613GB/102s). Folks, remember that to do what I just did in the following text box with Fibre Channel I’d have to have a system with 15 FC HBAs attached to several huge SAN arrays. Oh, and I should point out that it would also require about 85 Netezza Snippet Processing Units to match this throughput. The following query uses a method for measuring cell activity by forcing the database to ingest all rows and all columns. Don’t try to make sense of the query because it isn’t supposed to make sense. It is only supposed to drive Exadata to return all rows and all columns, which it does. The following text box shows that when I ran the query Exadata (in aggregate) scanned 613 GB of disk and returned all but 6% to the RDBMS instance (delta cell physical IO interconnect bytes). Also recorded by v$sysstat (bytes eligible) is the fact that there was nothing peculiar about the data being scanned-peculiar in any such fashion that would have interfered with offload processing (e.g., chained rows, etc). Since I asked for all the data, that is what I got. It is nice to know, however, that the entirety of the data was a candidate for offload processing. Notice I didn’t time the query. I’ll offer more on that later in this blog post. So let’s take a look at some offload processing. The following change to the “ingest” query reduces the amount of data ingested by the database tier by only selecting rows where the credit card number started with 4777 or 3333. We know from the scan of the table that this whittles down the dataset by 99.7%. 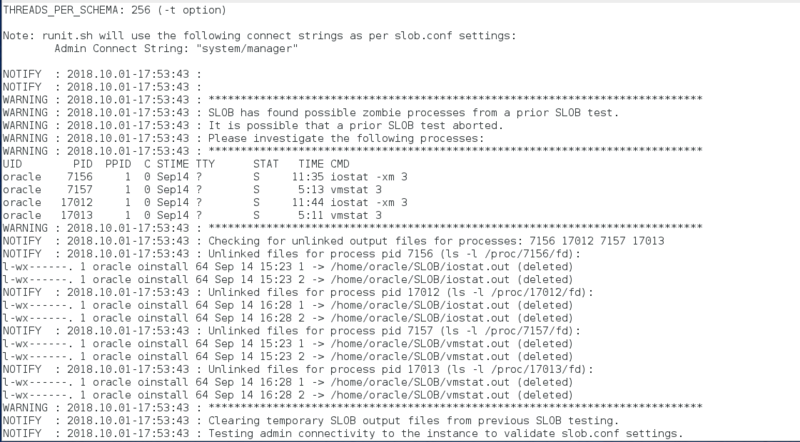 The following text box shows that that Exadata scanned and filtered out the uninteresting rows. The projected columns accounted for only 1.7 GB across the iDB intelligent I/O fabric. That is, the database tier only had to ingest 1.7 GB, or 17 MB/s since the query completed in 103 seconds. So, yes, Exadata does let you see how effectively Smart Scans are working. In this example we saw a single-table scan on a small Oracle Exadata Storage Server grid weeding out 99.7% of the data. You’ll notice when I executed demo_offload_bytes.sql (the non-filtering example) I was not tracking query completion time. That’s because up to this point I’ve only been showing examples driven by a single Real Application Clusters node. Now, let’s think about this. I have 8 Intel processor cores and a single inbound Infiniband path on the database server. From an inbound I/O bandwidth perspective the host can “only” ingest 1.6GB/s, but the CPUs may also further throttle that since the database is doing its own projection in this case. 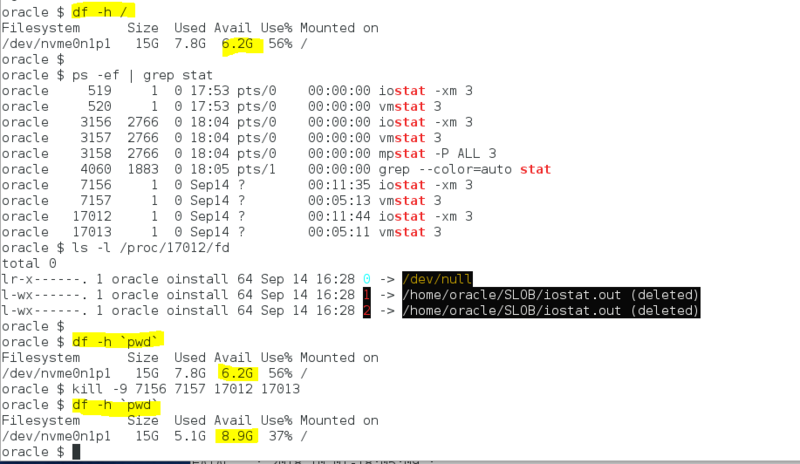 I’ve shown, in this post, that this test Exadata Storage grid configuration can scan disk at 6 GB/s. The question you might ask-and I’m about to answer-is how much does this single database host throttle storage and why does that matter? Well, it matters because having ample storage bandwidth with limited database server bandwidth is the classic imbalance addressed by the HP Oracle Database Machine. So, let me run it again-with timing turned on. As you’ll see, bottlenecks are bottlenecks. This single database host cannot keep up with storage, so storage is throttled and the result is 18X increase in query completion time when compared to the heavily filtered case. Both queries had to read the same amount of data but in this case there was an imbalance in the upstream ability to ingest the data both from an I/O bandwidth and CPU perspective. Need More RDBMS Bandwidth? OK, Use It. So, let’s see what the full-ingestion case looks like with 4 Real Application Clusters nodes. And please forgive that I forgot to aggregate the v$sysstat output. I’ve added 4-fold database grid resources so I should complete the full-ingestion query in 75% less time. The text box starts out showing that the number of RAC instances was increased from 1 to 4. Exadata works and has statistics so that the solution doesn’t feel so much like a black box. In the end, however, none of the statistcs stuff really matters. What matters is whether your queries complete in the desired service times. Databases are the Contents of Storage. Future Oracle DBAs Can Administer More. Why Would They Want To? A Database Storage Grid does not depend on flawless execution from its component storage arrays. Instead, it is designed to tolerate the failure of individual storage arrays. In spite of the fact that the Resilient Low-Cost Storage Initiative program was decommissioned along with the Oracle Storage Compatability Program, the concepts discussed in that paper should be treated as a barometer of the future of storage for Oracle databases-with two exceptions: 1) Fibre Channel is not the future and 2) there’s more to “the database” than just the database. What do I mean by point 2? Well, with features like SecureFiles, we aren’t just talking rows and columns any more and I doubt (but I don’t know) that SecureFiles is the end of that trend. Oracle DBAs of the future become even more critical to the enterprise since the current “stove-pipe” style IT organization will invariably change. In today’s IT shop, the application team talks to the DBA team who talks to the Sys Admin team who tlks to the Storage Admin team. All this to get an application to store data on disk through a Oracle database. I think that will be the model that remains for lightly-featured products like MySQL and SQL Server, but Oracle aims for more. Yes, I’m only whetting your appetite but I will flesh out this topic over time. Here’s food for thought: Oracle DBAs should stop thinking their role in the model stops at the contents of the storage. So while Chen Shapira may be worried that DBAs will get obviated, I’d predict instead that Oracle technology will become more full-featured at the storage level. Unlike the stock market where past performance is no indicator of future performance, Oracle has consistently brought to market features that were once considered too “low-level” to be in the domain of a Database vendor. The IT industry is going through consolidation. I think we’ll see Enterprise-level IT roles go through some consolidation over time as well. DBAs who can wear more than “one hat” will be more valuable to the enterprise. Instead of thinking about “encroachment” from the low-end database products, think about your increased value proposition with Oracle features that enable this consolidation of IT roles-that is, if I’m reading the tea leaves correctly. Believe me, my positions on Fibre Channel have prompted some fairly vile emails in my inbox-especially the posts in my Manly Man SAN series. Folks, I don’t “have it out”, as they say, for the role of Storage Administrators. I just believe that the Oracle DBAs of today are on the cusp of being in control of more of the stack. Like I said, it seems today’s DBA responsibilities stop at the contents of the storage-a role that fits the Fibre Channel paradigm quite well, but a role that makes little sense to me. I think Oracle DBAs are capable of more and will have more success when they have more control. Having said that, I encourage any of you DBAs who would love to be in more control of the storage to look at my my post about the recent SAN-free Oracle Data Warehouse. Read that post and give considerable thought to the model it discusses. And give even more consideration to the cost savings it yields. Now my alter ego (who is a DBA, whereas I’m not) is asking, “Why would I want more control at the storage level?” I’ll try to answer him in blog posts, but perhaps some of you DBAs can share experiences where performance or availability problems were further exacerbated by finger pointing between you and the Storage Administration group. Please, please, do not fill my email box with vitriolic messages about the harmony today’s typical stove-pipe IT organization creates. I’m not here to start battles. Why is it that the industry needed SANs to get more than a few hundred disks attached to a high-end Oracle system in the late 1990s and yet today’s Oracle databases often reside on LUNs comprised of a handful of drives in a SAN? The very thought of that twist of fate makes me feel like a fish flopping around on a hot sidewalk. Do you remember my post about capacity versus spindles? Oh, right, SAN cache makes that all better. Uh huh. Am I saying the future is DAS? No. Can I tell you now exactly what model I’m alluding to? Not yet, but I enjoy putting out a little food for thought. 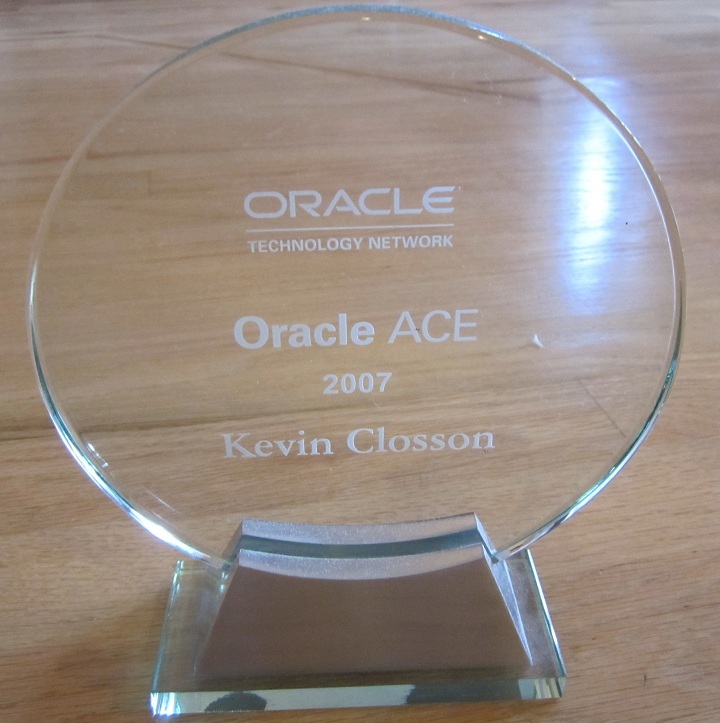 What Oracle Topic Is On Your Coffee Table? I’ve received a couple of emails over the last few weeks in which readers asked me what my favorite blog posts are on my own blog. I’d have to sift through old posts to answer that definitively, but one recent post comes to mind. I think my recent post about why Oracle shops generally aren’t realizing the full potential of their hard drives is one of my favorites.